As mentioned in my recommendations for improving walkability in midtown/downtown, in response to the Sacramento Grid 2.0 program, I’ve developed more information including a map (at bottom) about the locations in the grid that are signed against pedestrian crossing. The signs at these locations may be the modern MUTCD R9-3a sign, shown at right, or the older text sign, shown below, or variety of non-standard signs. Update 2015-07-27: 37 locations. 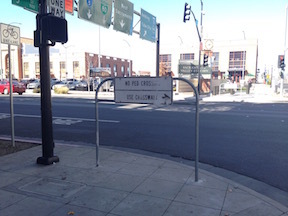 There are a large number of other locations where crossing is discouraged by the lack of sidewalks, curb ramps, and crosswalks, but is not specifically prohibited. 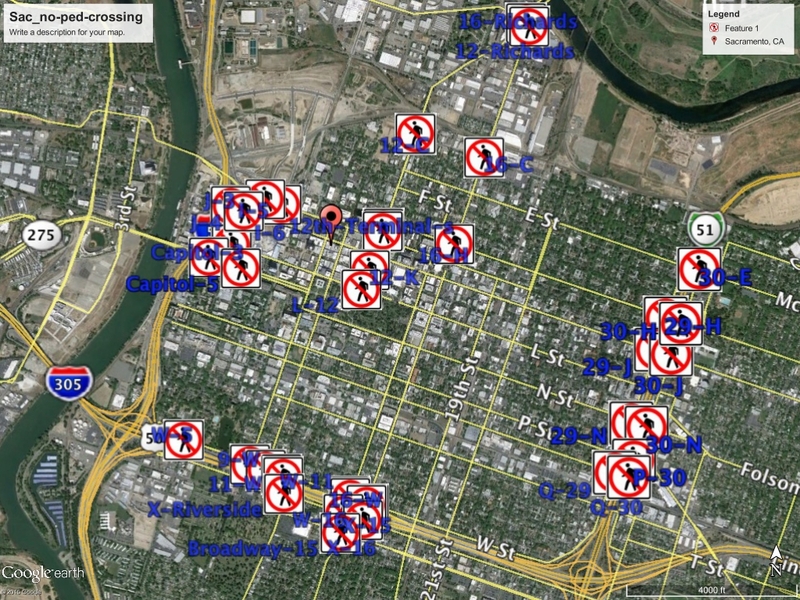 As can be seen from the map below, the majority of the no pedestrian crossing locations are along the Capitol Expressway (Business 80) and US 50 freeways. These freeways, designed and constructed by Caltrans, are barriers to pedestrian use. In fact, they are a barrier to all use and livability because many of the grid streets do no continue under the freeways, making access more difficult for pedestrians, bicyclists, and motor vehicle drivers. 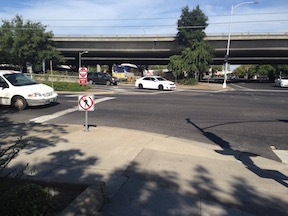 In many cases there are no sidewalks on the freeway side of the adjacent surface street, so whether or not there is a safe or marked crossing doesn’t mean much without a sidewalk to connect to. In many cases these prohibitions are solely for the benefit of motor vehicle drivers, allowing them to speed, turn without slowing, and ignore pedestrians. Each one requires a pedestrian to cross three times instead of once, and to go three times as far. They are an active discouragement to walking. The prohibitions are usually not for safety of pedestrians, though that is what is claimed by traffic engineers. In the case of freeway on-ramps and off-ramps along Capitol Expressway and US 50, however, there are actual safety issues. The intersections were designed without pedestrians in mind to allow high-speed entry and exit from the freeways, and in some cases it may take actual reconfiguration to make them safe. The remainder of the prohibitions could be removed by removing the signs, marking crosswalks, placing temporary signs to warn drivers of the changed street, and in some cases adding pedestrian signals for that leg of the intersection. I am not claiming that I have identified all locations in the grid. I partly used Google Earth and partly field checking to identify locations. Please let me know if I have missed or mis-described any locations. The project to identify these prohibitions throughout the city, and the county, would be huge, and I don’t know that I’ll ever accomplish that, but if you care about a particular area, please document it, and I’ll be happy to share your work. The data is available as kmz if you want to view the placemarks in detail with Google Earth, which includes the R9-3a sign graphic, or gpx if you want to view the placemarks in other applications as data points. Note: As more locations are identified, I will update the map below, update the kmz and gpx files, and add photos to the Flickr album. Last update: 2015-08-06.